This article is about early humans. For migrations of modern humans, see Out of Africa II. In palaeoanthropology, Out of Africa I is the first series of hominin expansions into Eurasia, which took place from 1.8 to 0.8 million years ago (Ma). Shortly before in Africa, Homo erectus had descended from the woodland-restricted Homo habilis. H. erectus, diverging from H. habilis, adapted to the open grounds of the savannahs and arid landscapes, and later managed to expand out of East Africa, eventually into Eurasia. According to the recent African origin of modern humans hypothesis (Out of Africa II), anatomically modern humans started moving into Eurasia and replacing earlier hominins c. 100,000 years ago. The phrase Out of Africa used alone generally means Out of Africa II, the expansion of modern humans into Eurasia. Until the early 1980s, hominins were thought to have been restricted to the African continent in the Early Pleistocene, or until about 0.8 Ma; thus, archaeological efforts have been disproportionately focused on (East) Africa. Further, hominin migrations out of East Africa were probably rare in the Early Pleistocene, leaving a record of events broken in space and time. In general, archeological evidence does not fit simple theories of where the migrations took place and is insufficient to support elaborate conjectures. The oldest hominin sites are in East Africa. The earliest evidence for retouched tools is from Kada Gona, Ethiopia, and dates back to 2.6 – 2.5 Ma in the very early Pleistocene. They might be the product of Australopithecus garhi or Paranthropus aethiopicus, the two known hominins contemporary with the tools. Homo habilis is the first member of the Homo line and could have descended from the Australopithecus as early as 2.3 Ma; it is first attested in Lake Turkana, Kenya. Homo erectus seems to have appeared later, its earliest remains dating back to c. 1.9 – 1.6 Ma at Koobi Fora, Kenya. The two species would have lived face to face in East Africa for nearly half a million years. Well before Homo habilis disappeared (c. 1.4 Ma), Homo erectus had made it into Eurasia. The earliest well-dated Eurasian site is Dmanisi in Georgia, securely dated to 1.81 Ma. A skull found at Dmanisi is evidence for caring for the old. The skull shows that this Homo erectus was advanced in age and had lost all but one tooth years before death, and it is perhaps unlikely that this hominid would have survived alone. It is not certain, however, that this is sufficient proof for caring – a partially paralysed chimpanzee at the Gombe reserve survived for years without help. Early Pleistocene sites in North Africa, the geographical intermediate of East Africa and Georgia, are in poor stratigraphic context. The earliest of the dated is Ain Hanech in northern Algeria (c. 1.8 – 1.2 Ma), an Oldowan grade layer. These sites attest that early hominins have crossed the North African tracts, which are usually hot and dry. :2 Hominins were part of the East African biome, and a flux in climate could have briefly expanded their environment, giving them the chance to move north. There is little time between Homo erectus’ apparent arrival in South Caucasus around 1.81 Ma, and its probable arrival in East and Southeast Asia. There is evidence of hominins in Yuanmou, China, dating to 1.7 Ma and in Sangiran, on Java, Indonesia, from 1.66 Ma. It appears hominins took longer to move into Europe, the earliest site being Barranco León in southeastern Spain dated to 1.4 Ma and a controversial Pirro Nord in Southern Italy, allegedly from 1.3 – 1.7 Ma. In any case, by 1 Ma, hominins had settled in most of the Old World. It is hard to say, however, whether settlement was continuous in Western Europe, or if successive waves repopulated the territory in glacial interludes. Early Acheulean tools at Ubeidiya from 1.4 Ma is some evidence for a continuous settlement in the West, as successive waves out of Africa after then would likely have brought Acheulean technology to Western Europe. The Sinai Peninsula is the simplest African exit route, being since the Pliocene the only land bridge between the two continents of the Old World. Unless one argues for boats on behalf of Homo erectus, it is surely the only way out. However, it was hard to access until the Middle Pleistocene. The Nile was much smaller a river and followed a different course. There are two Eurasian entryways that take advantage of the Sinai. First, the Levantine corridor, which moves north along the Eastern Mediterranean. Second, down the eastern bank of the Red Sea. Archaeological efforts in Arabia are limited, and attention is usually given to the Levantine corridor. The Bab-el-Mandeb is a 30 km strait between East Africa and the Arabian Peninsula, with a small island, Perim, 3 km off the Arabian bank. The strait has a major appeal in the study of Eurasian expansion in that it brings East Africa in direct proximity with Eurasia. It doesn’t require hopping from water body to the next across the North African desert. The land connection with Arabia disappeared in the Pliocene, and though it may have briefly reformed, the evaporation of the Red Sea and associated increase in salinity would have left traces in the fossil record after just 200 years and evaporite deposits after 600 years. Neither have been detected. A strong current flows from the Red Sea into the Indian Ocean and crossing would have been difficult without a land connection. 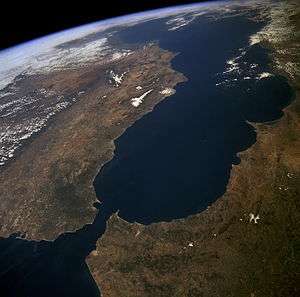 The Strait of Gibraltar is the Atlantic entryway to the Mediterranean, where Spanish and Moroccan banks are only 14 km apart. A decrease in sea levels in the Pleistocene due to glaciation would not have brought this down to less than 10 km. Deep currents push westwards, and surface water flows strongly back into the Mediterranean. The current would likely lose a swimmer or an unsteered raft. Entrance into Eurasia across the strait of Gibraltar could explain the hominin remains at Barranco León in southeastern Spain (1.4 Ma) and Sima del Elefante in northern Spain (1.2 Ma). But the site of Pirro Nord in southern Italy, allegedly from 1.3 – 1.7 Ma, suggests a possible arrival from the East. Resolution is insufficient to settle the matter. 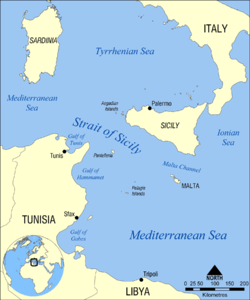 The modern Strait of Sicily separates Tunisia and Sicily by 145 km, but is shallow and would have been much narrower in glacial maxima. We have a poor understanding of plate tectonics of this area for the greater part of the Pleistocene. But while plate tectonics could have made the strait narrower than predicted by the lowering of sea levels alone, contrast of Pleistocene fauna strongly argues against an actual land bridge. :3 Since the strait is only 400 km away from the North African hominin site of Ain Hanech in Algeria (1.8 Ma or 1.2 Ma) it remains a plausible route for Early Pleistocene expansion into Eurasia. However, there is close to no evidence for a hominin passage. Alimen based most of her argument in favour of such a migration on Bianchini’s discovery of Sicilian Oldowan grade tools. But radiometric dates have not been produced, and the artefacts might as well be from the Middle Pleistocene. Presence of hominin remains in Indonesian islands is good evidence for seafaring by Homo erectus late in the Early Pleistocene. Bednarik suggests that navigation had appeared by 1 Ma, possibly to exploit offshore fishing grounds. He has reproduced a primitive dirigible raft to demonstrate the feasibility of faring across the Lombok Strait on such a device, which he believes to have been done before 850 ka. The strait has maintained a width of at least 20 km for the whole of the Pleistocene. Such an achievement by Homo erectus in the Early Pleistocene offers some strength to the suggested water routes out of Africa, as the Gibraltar, Sicilian, and Bab-el-Mandeb exit routes are harder to consider if boats are deemed beyond the capacities of Homo erectus. It is unlikely that hominins populated Eurasia after a one-off event getting a few hominins across a strait (such as a Homo erectus family drifting on flood debris and landing on a Eurasian bank). There are biological constraints to the minimum size a population must maintain to avoid extinction. That is to say, if less than 50 hominins at once made it into Eurasia and lost contact with African hominins, the population would likely undergo an extinction vortex, in part due to inbreeding. For a given species in a given environment, available resources will limit the amount of individuals that can survive indefinitely. This is the carrying capacity. Upon reaching this threshold, individuals may find it easier to gather resources in the poorer yet less exploited peripheral environment than in the preferred habitat. Homo habilis could have developed some baseline behavioural flexibility prior to its expansion into the peripheries (such as encroaching into the predatory guild). This flexibility could then have been positively selected and amplified, leading to Homo erectus’ adaptation to the peripheral open habitats. A new and environmentally flexible hominin population could have come back to the old niche and replace the ancestral population. Moreover, some step-wise shrinking of the woodland and the associated reduction of hominin carrying capacity in the woods around 1.8 Ma, 1.2 Ma, and 0.6 Ma would have stressed the carrying capacity’s pressure for adapting to the open grounds. With Homo erectus’ new environmental flexibility, favourable climate fluxes likely opened it the way to the Levantine corridor, perhaps sporadically, in the Early Pleistocene. Lithic analysis implies that Oldowan hominins weren't predators. However, Homo erectus appears to have followed animal migrations to the north during wetter periods, likely as a source of scavenged food. The sabre-tooth cat Megantereon was an apex predator of the Early and Middle Pleistocene (before MIS 12). It became extinct in Africa c. 1.5 Ma, but had already moved out through the Sinai, and is among the faunal remains of the Levantine hominin site of Ubeidiya, c. 1.4 Ma. It couldn’t break bone marrow and its kills were likely an important food source for hominins, especially in glacial periods. Bar-Yosef and Cohen suggest that the success of hominins within Eurasia once out of Africa is in part due to the absence of zoonotic diseases outside their original habitat. Zoonotic diseases are those that are transmitted from animals to humans. While a disease specific to hominins must keep its human host alive long enough to transmit itself, zoonotic diseases won't necessarily do so as they can complete their life cycle without humans. Still, these infections are well accustomed to human presence, having evolved alongside them. The higher an African ape's population density the better a disease fares. Fifty-five percent of chimps at the Gombe reserve die of disease, most of them zoonotic. The majority of these diseases are still restricted to hot and damp African environments. Once hominins had moved out into dryer and colder habitats of higher latitudes, one major limiting factor in population growth was out of the equation. Thermoregulation and dehydration are major problems that need to be dealt with to move into the open grasslands. In particular, vascularisation of the brain is crucial in maintaining it in the narrow frame of tolerable temperatures. Bones of the higher cranium grow in response to expansion of cerebral mass, in such a way that brain tissue and blood vessels mold the inner brain case. Endocranial casts of fossil skulls allow approximating brain vascularisation. Dean Falk noticed that a single large vessel, the occipital marginal sinus, was responsible for irrigating most of the brain in early australopiths (Australopithecus afarensis, Paranthropus robustus and boisei). The vessel grew smaller with time to be progressively replaced by a network of small veins in later hominins, starting with Homo habilis and continuing well into Eurasia. She interprets the change as an adaptation to cool the brain, which she uses to advance her “radiator theory” for accelerated encephalisation from Homo habilis onwards. To Falk, bipedalism, which predates large brains, favoured a rewiring of cerebral blood vessels into a gravity-assisted irrigation network, itself allowing the cool down needed for encephalisation. Endocranial casts of Homo habilis and Homo erectus differ in the organisation of the frontal lobe, in particular in the prefrontal cortex where higher mental functions of consciousness and abstraction occur. By themselves, mental capacities have likely played a role in the success of Eurasian colonisation. They would have allowed for greater social complexity, predation and sharing prey, and an overall higher quality diet. If we are to believe Bednarik and his seafaring Indonesian Homo erectus, then the brain must have played a role in crossing channels. According to Wheeler, loss of functional body hair would have helped prevent hyperthermia, since hair will obstruct air flow over the skin and restrict cooling by evaporation. He further suggests that body cooling due to hair loss has relieved a thermal constraint on brain size (but in a response to Falk’s radiator hypothesis, Ralph Holloway maintains that there is no evidence for a temperature constraint on brain size). However, differences in body hair between Homo habilis and Homo erectus are impossible to test, and it will remain unclear whether hair loss was part of the hominin adaptation or preadaptation to Eurasia. 1 2 Zimmer, Carl (September 21, 2016). "How We Got Here: DNA Points to a Single Migration From Africa". New York Times. Retrieved September 22, 2016. ↑ Templeton, A.R. (2016). "Chapter 5 -- World Dispersals and Genetic Diversity of Mankind: The Out-of-Africa Theory and Its Challenges". In Michel Tibayrenc; Francisco J. Ayala. On Human Nature. pp. 65–83. ISBN 9780124201903. 1 2 3 4 Lahr, M.M., 2010. “Saharan Corridors and Their Role in the Evolutionary Geography of ‘Out of Africa I’”. In: A. Baden et al. (Eds. ), Out of Africa I: The First Hominin Colonization of Eurasia. Springer Netherlands, 27–46. 1 2 Straus, L. G., & Bar-Yosef, O. (2001). “Out of Africa in the Pleistocene: an introduction”. Quaternary International 75(1), 2–4. ↑ Van Arsdale, A. P. (2013) “Homo erectus - A Bigger, Smarter, Faster Hominin Lineage”. Nature Education Knowledge, 4(1):2. ↑ Bauer, H. R. (1977). “Chimpanzee Bipedal Locomotion in the Gombe National Park, East Africa”. Primates, 18, 913–921. 1 2 Sahnouni, M., Hadjois, D., van der Made, J., Derradji, A. Canals, A., Medig, M., Belahrech, H., Harichane, Z., and Rabhi, M. (2002). "Further research at the Oldowan site of Ain Hanech, North-eastern Algeria." Journal of Human Evolution 43(6): 925-937. 1 2 Geraads, D., Raynal, J.-P., Eisenmann, V. (2004). The earliest occupation of North Africa: a reply to Sahnouni et al.(2002). Journal of Human Evolution 46, 751–761. ↑ Redfield, T. F., Wheeler, W. H., & Often, M. (2003). A kinematic model for the development of the Afar depression and its paleogeographic implications. Earth and Planetary Science Letters, 216, 383–398. ↑ Carbonell, E., J. M. Bermudez de Castro, J. L. A., Allue, E., Bastir, M., Benito, A., Caceres, I., … Verges, J. M. (2005). “An Early Pleistocene hominin mandible from Atapuerca-TD6, Spain”. Proceedings of the National Academy of Sciences, 102(16), 5674–5678. ↑ Alimen, H. (1975). “Les “Isthmes” hispano-marocain et Sicilo-Tunisien aux temps Acheuléens”. L’Anthropologie, 79, 399–436. ↑ Bianchini, G. (1973). Gli “hacheraux” nei giacimenti paleolitici della Sicilia sud occidentale. Atti della XV Riunione Scientifica dell’Istituto Italiano di Preistoria e Protostoria, 11–25 Ottobre 1972. ↑ Villa, P. (2001). Early Italy and the colonization of Western Europe. Quaternary International, 75, 113–130. ↑ Bednarik, R. G. (2001). “Replicating the first known sea travel by humans: the Lower Pleistocene crossing of Lombok Strait”. Journal of Human Evolution, 16(3), 229–242. ↑ Lewis, M. E., & Werdelin, L. (2007). “Patterns of change in the Plio-Pleistocene carnivorans of eastern Africa: Implications for hominin Evolution”. In R. Bobe, Z. Alemseged, & A. K. Behrensmeyer (Eds. ), Hominin environments in the East African Pliocene: An assessment of the faunal evidence. Springer, 77–106. ↑ Potts, R. “Evolution and climate variability” (1996), Science, 273, 922–923. ↑ Cerling, T.E., Harris, J.M., MacFadden, B.J., Leakey, M.G., Quade, J., Eisenmann V., Erleringer, J.R. (1997). “Global vegetation change through the Miocene/Pliocene boundary”, Nature, 389, 153–158. ↑ Shipman, P. A. T. (1984). Hunting in Early Hominids: Theoretical Framework and Tests, 27–43. ↑ Lewis, M.E., Werdelin, L. (2010). “Carnivoran Dispersal Out of Africa During the Early Pleistocene: Relevance for Hominins?”. In: A. Baden et al. (Eds. ), Out of Africa I: The First Hominin Colonization of Eurasia. Springer Netherlands, pp. 13-26. ↑ Turner, A. (1999). Assessing earliest human settlement of Eurasia: Late Pliocene dispersions from Africa. Antiquity, 73, 563–570. ↑ Goodall, J., (1986). “The Chimpanzees of Gombe: Patterns of Behavior”. Belknap Press of Harvard University Press, Cambridge, MA. ↑ Wheeler, P. E. (1992). “The thermoragulatory advantages of large body size for hominids foraging in Savannah environments”. Journal of Human Evolution, 23(4), 351–362. ↑ Klein, R. G. (1999). The human career: Human biological and human origins, (2nd ed.). Chicago: Chicago University Press. 249-250. ↑ Bruner, E. (2003). “Fossil traces of the human thought : paleoneurology and the evolution of the genus Homo”. Rivista di Antropologia [Journal of Anthropological Sciences], 81, 29–56. ↑ Falk, D. (1988). “Enlarged occipital/marginal sinuses and emissary foramina: Their significance in hominid evolution”. In: The evolutionary history of the "robust" australopithecines, (eds. F. Grine. Aldine). ↑ Holloway, R. L., Sherwood, C. C., Hof, P. R., & Rilling, J. K. (2009). “Evolution of the Brain in Humans – Paleoneurology”. In Encyclopedia of Neuroscience, 1326-1338. ↑ O’ Connell J. F., Hawkes, K., & Jones, N. G. B. (1999). “Grandmothering and the evolution of Homo erectus.” Journal of Human Evolution, 36, 461–485. ↑ Stanford, C.B., 1998. The social behavior of chimpanzees and Bonobos: empirical evidence and shifting assumptions. Current Anthropology, 39, 399–420. ↑ Aiello, L.C., Wheeler, P., 1995. Expensive-tissue hypothesis: the brain and digestive system in human and primate evolution. Current Anthropology 36, 199}221. ↑ Wheeler, P. E. (1985). “The Loss of Functional Body Hair in Man: the Influence of Thermal Environment, Body Form and Bipedality” Journal of Human Evolution, 14(1), 23–28. doi:10.1016/S0047-2484(85)80091-9. ↑ Holloway, R. L. (1990). “Falk's radiator hypothesis”. Behavioral and Brain Sciences, 13(2), 360. doi:10.1017/S0140525X00079139. Eudald Carbonell; Marina Mosquera; Xosé Pedro Rodríguez; José María Bermúdez de Castro; Francesc Burjachs; Jordi Rosell; Robert Sala; Josep Vallverdú (2008), (subscription required), "Eurasian Gates: The Earliest Human Dispersals", Journal of Anthropological Research, 64 (2): 195–228, JSTOR 20371223. Ciochon, Russell L. (2010), "Divorcing Hominins from the Stegodon–Ailuropoda Fauna: New Views on the Antiquity of Hominins in Asia", in John G. Fleagle et al. (eds), Out of Africa I: The First Hominin Colonization of Eurasia, Vertebrate Paleobiology and Paleoanthropology Series, Dordrecht: Springer, pp. 111–26, doi:10.1007/978-90-481-9036-2_8, ISBN 978-90-481-9035-5. ISBN 978-90-481-9036-2 (online). Dennell, Robin (2010), "'Out of Africa I': Current Problems and Future Prospects", in John G. Fleagle et al. (eds), Out of Africa I: The First Hominin Colonization of Eurasia, Vertebrate Paleobiology and Paleoanthropology Series, Dordrecht: Springer, pp. 247–74, doi:10.1007/978-90-481-9036-2_15, ISBN 978-90-481-9035-5. ISBN 978-90-481-9036-2 (online). Zaim, Yahdi (2010), "Geological Evidence for the Earliest Appearance of Hominins in Indonesia", in John G. Fleagle et al. (eds), Out of Africa I: The First Hominin Colonization of Eurasia, Vertebrate Paleobiology and Paleoanthropology Series, Dordrecht: Springer, pp. 97–110, doi:10.1007/978-90-481-9036-2_7, ISBN 978-90-481-9035-5. ISBN 978-90-481-9036-2 (online).